Six kamikaze planes hit the destroyer minelayer USS Aaron Ward (DM-34) in the early evening of May 3, 1945. Although the attacks killed 42 men, the ship managed to stay afloat but never returned to action. Arnold Lott, a former Navy Lieutenant Commander who sailed in the 1920s on the first destroyer named Aaron Ward, performed extensive research for this history. This included numerous interviews with surviving crewmembers and bereaved family members, examining official Navy logs and action reports, and reading hundreds of letters from the crew. Brave Ship Brave Men, a tribute to the courageous men who served on Aaron Ward, depicts regular life aboard the ship before the kamikaze attacks and provides personal glimpses into the crew's emotions as they faced incoming planes and recovered after the strikes. The first five of eight chapters cover the ship's first five watches on May 3, 1945, from midnight up to 6 p.m., as the crew waits in anticipation of Japanese plane attacks. The author introduces the ship's history through a series of flashbacks. Aaron Ward, which had been originally built as a destroyer (DD-773), was converted to a destroyer minelayer before her commissioning in October 1944. These first few chapters also describe the many different jobs of the some 350 men aboard this ship. The crew passes the first 18 hours of May 3 with little excitement but much tension about enemy planes that could appear over the horizon at any moment. Chapters 6 and 7 describe the attack by about 25 kamikaze planes on the five ships at Radar Picket Station 10: Aaron Ward, destroyer Little, and three smaller support ships. Aaron Ward gets attacked by 11 planes within one hour, but the ship's gunners managed to down five of the incoming planes. However, six others crashed into Aaron Ward, and the engine, propeller, and a wing of one downed plane also hit the ship. 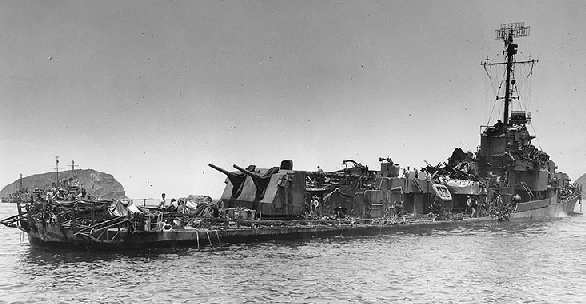 Four kamikaze hits sunk the destroyer Little with the loss of 30 men, and a kamikaze plane also crashed into and quickly sunk the LSMR-195 (Landing Ship, Medium (Rocket)) as the rockets loaded on board exploded. Aaron Ward, dead in the water, received help from her sister ship, the destroyer minelayer Shannon (DM-25), which came from Okinawa and towed Aaron Ward through the night to Kerama Retto, a group of small islands off the southwestern coast of Okinawa. The last chapter tells about Aaron Ward 's cleanup and temporary repairs at Kerama Retto in order to try to return to the States for more extensive repairs. After the surviving crew cleaned the decks of body parts and metal scraps, kamikaze attacks continued while the ship remained moored at Kerama Retto hidden under smoke screens. Aaron Ward left Okinawa on June 11, 1945, and returned to San Diego under her own power on July 8. The final chapter includes several moving stories of how families of dead seamen reacted to the news. The author does an admirable job in relating not only Aaron Ward's historical facts but also many personal anecdotes. For example, when a father whose son had died on Aaron Ward read that the ship was to be scrapped, he wanted something to remember his son. He chose the ship's 4,000-lb. anchor, which the U.S. Navy shipped by rail to his home in Elgin, Illinois. The anchor still remains in Elgin, far from any ocean, as a memorial to his son and to all the brave men who served aboard Aaron Ward. The book also contains interesting tidbits about life aboard ship, such as the importance of coffee to the crew and the gourmet food served to officers by the former chef of the Golden Pheasant restaurant in San Francisco. 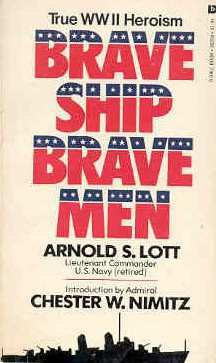 Lott evidently intended Brave Ship Brave Men to be a eulogy for Aaron Ward, since the book contains only glowing descriptions of crewmen and their relationships with each other. Although the book includes numerous names of individuals, the reader never really gets to know many details about any particular crewman. At various points, the author lists off just the names of ships sunk or damaged on specific dates by suicide planes, but he provides little background information on American and Japanese battle strategies. The kamikaze planes that attacked American ships at Radar Picket Station 10 came from Taiwanese air bases and included both Army and Navy planes (Hara 2004, 215). The author provides almost no details on these Japanese planes, and he refers to Japanese planes in some places as "Tojo's Bats" or "Bushido Boys" rather than provide any specifics regarding kamikaze planes involved in the Battle of Okinawa. The book also lacks any discussion of why CAP (Combat Air Patrol) from nearby American aircraft carriers failed to intercept these Japanese planes in a more timely manner. The back cover inaccurately states that ten kamikaze planes slammed into the Aaron Ward, but actually six planes hit the ship (pp. 246, 250). Arnold Lott succeeded in the daunting task of researching, organizing, and writing the illustrious history of destroyer minelayer Aaron Ward. When one of the kamikaze planes approached the ship, "everyone had the same impression, that the plane was heading right at him." This book puts you right in the middle of the action as kamikaze planes attacked the Aaron Ward. The ship's men earned the Presidential Unit Citation for their distinguished service.